Review by AllTheBestFights.com: 2016-09-17, some good exchanges between Joseph Diaz and Andrew Cancio but it is not enough to get three stars: it gets two. The undefeated Joseph Diaz entered this fight with a perfect boxing record of 21-0-0 (12 knockouts) and he is ranked as the No.12 featherweight in the world. He has already fought twice in 2016 winning over Jayson Velez (=Diaz vs Velez) and Victor Proa (=Diaz vs Proa). His opponent, Andrew Cancio, has an official record of 17-3-2 (13 KOs=76%) and he entered as the No.21 super featherweight. He lost to Ronny Rios in 2014 (=Rios vs Cancio) but then he has beat Rene Alvarado and Hugo Fidel Cazares. 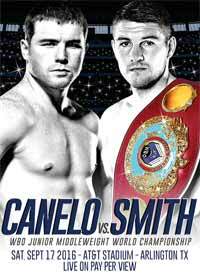 JoJo Diaz vs Cancio is valid for the NABF featherweight title; undercard of Saul Canelo Alvarez vs Liam Smith. Watch the video and rate this fight! Review: 2014-04-14, amazing performance by both fighters: Ronny Rios vs Andrew Cancio is very close to get four stars!! The undefeated Ronny Rios entered this fight with a perfect record of 22-0-0 (10 knockouts) and he is ranked as the No.17 featherweight in the world, he fought three times in 2013 winning the NABF Fw title against Rico Ramos (=Rios vs Ramos). His opponent, Andrew Cancio, has a record of 15-2-2 (11 knockouts) and he entered as the No.59 super featherweight, he suffered his last defeat in 2012 against Roger Gonzalez (via majority decision), after that bout he fought and won just once in 2013 (a unanimous decision win over Jerry Belmontes). 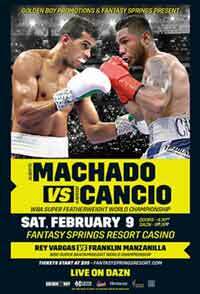 Rios vs Cancio is the main event of the evening. Watch the video and rate this fight!